At the Wi‑Fi Connected City Building Wi-Fi.HK Together promotion day and commendation ceremony held on August 17, the Office of the Government Chief Information Officer (OGCIO) announced the launch of the Wi-Fi.HK pilot Public-Private Collaboration (PPC) project at government venues, signifying a milestone for the common brand Wi-Fi.HK. 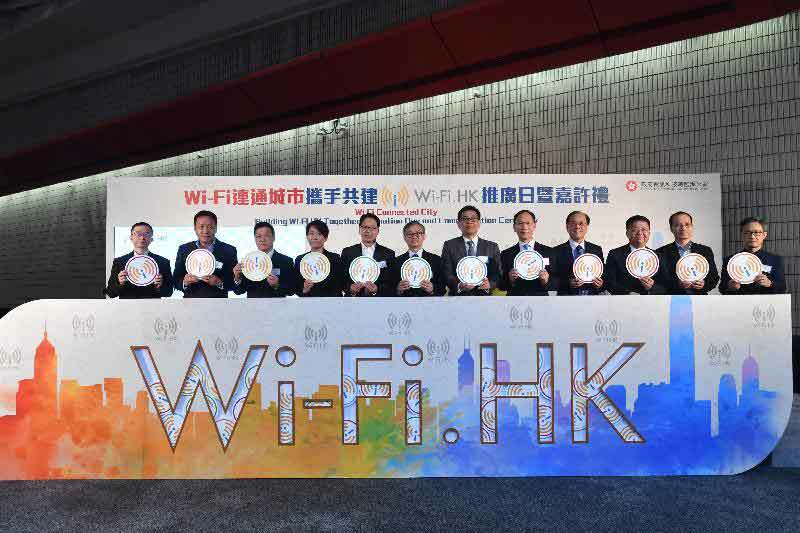 The ceremony was held on the fourth floor of the Hong Kong Cultural Centre which is among the first batch of government venues to offer free public Wi-Fi service under the PPC arrangement. Other venues include the Queen Elizabeth Stadium, Dr. Sun Yat-sen Museum, Shatin Town Hall, Man Kam To Control Point, the Hong Kong Cultural Centre Piazza, the Tsim Sha Tsui Promenade and the Hong Kong Coliseum. Addressing the ceremony, the Under Secretary for Innovation and Technology, Dr. David Chung, said, "We shall open up more suitable government venues through public-private collaboration for private service providers to install equipment and provide Wi-Fi service with free usage time at their own cost. Private service providers are allowed to offer value-added services at these venues without any financing from the Government while the public and tourists can enjoy free Wi‑Fi service. This arrangement is favourable to all." The four service providers will extend the free public Wi-Fi service to more government venues in the coming months, including other floors of the Hong Kong Cultural Centre, sitting-out areas in parks, public transport interchanges, land boundary control points and markets. Dr. Chung noted that building Hong Kong into a Wi-Fi Connected City not only facilitates public access to real-time information and enables users to keep in touch with families and friends, but also helps develop more innovative, efficient and convenient digital services in various sectors in Hong Kong. The move will be conducive to making Hong Kong a smart city. Since 2014, public Wi-Fi service has been available for free usage by local residents and tourists under the Wi-Fi.HK scheme at various locations across the territory, and the coverage continues to expand. The download rate for Wi-Fi.HK mobile app has also exceeded 240 000, marking the successful collaboration between government and public organisations/private sector. There are at present over 19 800 Wi-Fi hotspots provided by some 50 participating organisations, covering places such as campuses of tertiary institutions, tourism attractions, cultural and sports venues, entertainment and leisure venues, government and public organisation offices, shopping centres, telephone booths and restaurants. To facilitate students in using Internet resources for study after school, the OGCIO launched a subsidy scheme in March this year and invited applications from non-profit-making organisations for providing free Wi-Fi service at their youth service centres and study rooms. Related Wi-Fi service is being gradually launched by these organisations with approved funding.